Remember how badly you wanted a PlayStation phone, only to find out that "experience" was headed to a multitude of devices across the Android spectrum? Well, it looks like Sony's finally making good on that retro-gaming promise. Starting today, the company's one stop shop for its classic games of yesteryear goes live in nine countries -- although, you'll have to be a Tablet S owner to partake of the PlayStation Certified nostalgia. 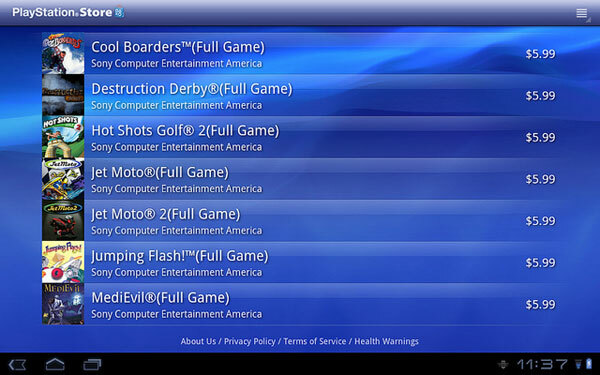 Helping Sony usher its fanbase back into the quaintness of 32-bit graphics are ten titles familiar to PSOne fans: Cool Boarders, Destruction Derby, Hot Shots Golf 2, Jet Moto 1 & 2, Jumping Flash!, MediEvil, Motor Toon Grand Prix, Rally Cross and Wild Arms. So, if you happen to be packing the electronic giant's non-foldable slate, get your thumbs primed for a capacitive walk down memory lane. No word on when those other certified devices will get to mine the company's gaming archives, but there's always the Vita for that. Guests online: 674. Total online: 674.